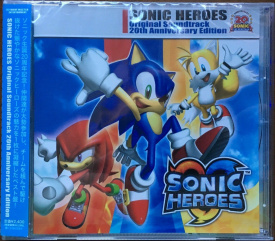 Sonic Heroes Original Soundtrack 20th Anniversary Edition is a "best-of" album containing the music from the 2003 multi-platform game Sonic Heroes. The album was released by Wave Master on 24 August 2011. It contains 26 of the original 50 tracks found in Complete Trinity Sonic Heroes - Original Soundtrax, as well as the additional four theme songs on Triple Threat Sonic Heroes Vocal Trax. It is the third release from Wave Master commemorating the 20th anniversary of the Sonic the Hedgehog franchise. This page was last edited on 5 April 2019, at 22:27.